If you have made the decision to install a new roof, one of next decisions will be whether to tear the existing roof off or to put the new roofing materials on top of the old one. Of the two choices, installing the new roof over the existing shingles will be less expensive and may result in a shorter timeline to completion. On the other hand, while tearing the existing roof off before the installation will cost more initially, there are several long term advantages to making this additional investment. Here are some of the factors to consider before making the decision between either tearing the old roof off or doing an installation on top of the old one. 1) If your roof already has two layers of shingles, a tear-off is mandatory – Current roofing codes do not allow for more than two layers of shingles on residential roofs. This aspect of the code was added due to the weight bearing stress on the supporting structure caused by multiple shingle layers. 2) Tearing off the existing shingles gives you a complete look at the condition of the roof deck – Clearing off the old shingles allows for a full view of the deck, which provides the opportunity to assess and repair areas that have been damaged by termites, dry rot, etc. 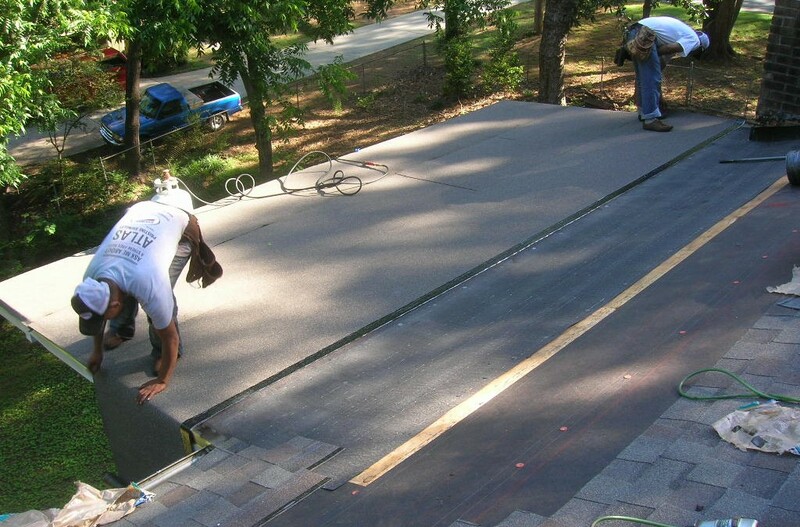 This is one of the advantages of spending the extra money for a full tear-off as damage to the deck can be concealed by the existing layer of shingles. 3) Working with a clean deck presents the opportunity to add a membrane to protect against damage from ice dams – These membranes provide added protection against water damage resulting from water that gets trapped by ice dams that build up on at the eaves. This type of shield cannot be installed on top of an existing layer of shingles. 4) A new roof is more secure when it’s attached directly to the deck – One of the biggest risks of installing a new roof over existing shingles is that this configuration is less resistant to the force of high winds. Lower resistance is due to the roof’s higher profile, which can allow wind to get under the shingles, combined with the fact that fastening shingles on top of shingles is less secure than attaching them directly to the deck. 5) Many roofing companies recycle old roofing materials – A growing number of roofing companies are involved in recycling programs that keep old roofing materials out of landfills. Installing a new roof over existing shingles may initially be the less expensive choice, but that can change with the first big storm. By tearing off the old shingles and starting with a clean deck, your new roof can be installed under conditions that foster durability for a long usable life. References: Deciding Between Tearing the Old Roof Off and Roofing Over It By KTM Roofing available under a Creative Commons Attribution 3.0.